If you are looking for the best balance bike for your child; look no further. The Prevelo Alpha Zero is here. If you haven’t done so already; please check out our review of the Alpha Zero HERE. Prevelo is all about the promotion of youth cycling. This is evident in their line of children’s bike. See the rest of the Prevelo line here and you will fully appreciate what Prevelo is doing for the youth cycling industry. Aluminum wheels, frame, components, handlebars make for a super light weight balance bike; it weighs a mere 8.5 lbs. Other features we love is the frame design with a low center of gravity, fame-routed brake cables, child-reach brake lever, polished aluminum frame and the fact that all Alpha Zeros are tuned and inspected prior to shipment. 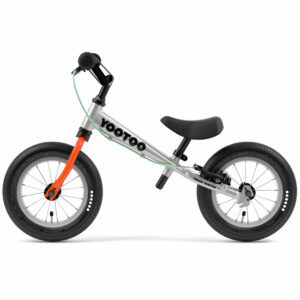 The best balance bike for kids is from WOOM and comes in 5 cool colors.